Kenji Mizoguchi is acknowledged as one of the masters of classic Japanese cinema, but his films are rarely exhibited or studied in film courses. One of the major reasons for this sad state of affairs is doubtlessly the poverty of Mizoguchi prints in circulation – they are both poor in quality and few in number. But the failure of distributors to remedy this deplorable situation may well be related to the poverty of critical material on his work. There was much interest in Mizoguchi from the 1950s to the 1970s, fostered initially by rapturous reviews of his late period films by the French critics (1) and Robin Wood (2), and later by the prominent position he was allotted by Audie Bock and Joan Mellen in their surveys of Japanese film directors and Japanese cinema, respectively (3). However, in recent decades, critics and academics writing in English have shifted their gazes elsewhere, devoting their attention to Yasujiro Ozu and Akira Kurosawa. The publication in 2005 of both this book and David Bordwell’s latest book, which includes a lengthy chapter celebrating and analysing the magnificent mises en scène (plural and varied) of Mizoguchi movies (4), is a hopeful sign of change and an acknowledgement of a serious gap. Anglophone film culture seems finally to be admitting that it is time we put Mizoguchi back into the picture. Though they are both fans of Mizoguchi, Le Fanu and Bordwell’s approaches are so different that they seem to inhabit different planets. While Bordwell is a scholarly film academic who, as a teacher and an author, has assiduously devoted his attention to industrial history and the close analysis of film form, using theoretical arguments in support of his “historical poetics” approach and disputing the claims of other theorists, Le Fanu is by his own admission a film critic who prefers film journalism to theory and avoids engaging in debates with scholars. Though his discussion covers a wide range of films and filmmakers, issues and topics, it is loosely associational, what used to be called “impressionistic”, rather than rigorously analytical. In fact he follows the approach of the Cahiers critics of the 1950s, not only quoting from them extensively and approvingly, but also regurgitating the old debates from the high point of auteurism. He rates Mizoguchi above Kurosawa, assesses Mizoguchi movies on a sliding scale (masterpiece, flawed masterpiece, lesser work, historical curiosity, inaccessible or unviewable work) and employs old-fashioned criteria for masterpiece rating: accessibility to a Western Christian audience, universality of theme, intensely moving performances, superbly crafted screenplay, artistic unity, exquisite visual style and mastery of the long take. In his view, Mizoguchi is the greatest master, ever and anywhere, of the long take. Neither Le Fanu nor Bordwell are specialists in Japanese studies nor do they speak Japanese but they have both worked hard to overcome these handicaps, albeit in different ways. Bordwell has employed research assistants and supervised graduate students who have studied Japanese film history and who speak and read Japanese. In addition, through extensive and intensive viewing and analysis of films, he has familiarised himself with the visual content of most of the surviving products of the vast output of the Japanese film industry and detailed Japanese films’ formal similarities to and variations from European and Hollywood models of filmmaking. Le Fanu has assiduously researched the historical background, critical reception, production history, theatrical and literary sources, socio-political context and narrative construction of all the extant Mizoguchi films. He quotes extensively from memoirs of, and interviews with, Mizoguchi’s collaborators, previously translated from Japanese and published in French film magazines (5), and has been assisted by Japanese friends to gain access to some additional Japanese publications. Acknowledging the difficulties of appreciating the films without knowledge of Japanese language and culture, Le Fanu incorporates a great deal of explanatory material on everything related to the films. 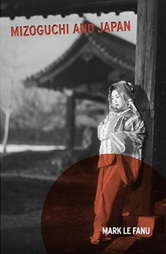 In his introductory chapter, he situates Mizoguchi among a vast array of practitioners of the long take, past and present, citing many European, American and Chinese art directors whose work is familiar to film buffs in general and habitués of the international film festival circuit in particular; and situates him also in a native Japanese artistic heritage – pointing to a quasi-cinematic use of off-screen space and a complexity of visual design in pre-modern Japanese wood-block prints, painted screens, and scroll paintings. In this book Le Fanu is clearly addressing an audience of film buffs who lack specialised knowledge of Japanese film and Japanese culture in general. He wants to arouse their desire to see Mizoguchi films and provide tools to aid their appreciation. These are commendable aims but his methods of argument may not be the best means to achieve them. He assumes that many western viewers are put off by some aspects of Japanese culture and its theatrical conventions – but I think he is mistaken. Since the 1920s, when a kabuki theatrical troupe toured Soviet Russia and western Europe, western viewers, playwrights, directors, actors and dancers have displayed a fascination with noh, kabuki, the puppet theatre and (more recently) butoh; and the experience of viewing performances of one or more of these dramatic forms made a great impact on influential modern European theorists like Sergei Eisenstein and Roland Barthes. Many young people in the west today, especially students, are fascinated by Japanese theatre and film and have no problem with Japanese performance conventions. Le Fanu bemoans the over-acting of performers in the Japanese silent cinema – as if there were no hamming in the western silents; and decries the incredible feats of prowess in dispatching opponents displayed by early jidai-geki heroes – which makes you think he hasn’t seen many Hollywood westerns or superhero movies! We all nowadays find the performances in silent movies over-the-top and sometimes laughable, but we also recognize Greta Garbo’s agonising and Fay Wray’s screaming as conventions. Le Fanu underestimates the sophistication of viewers. In pursuit of his aims, Le Fanu starts off with three introductory chapters, outlining (i) reasons to be interested in Mizoguchi; (ii) the political, industrial and cultural context in which he worked; and (iii) Mizoguchi’s meticulous and demanding methods of working with his collaborators. The first chapter is woolly in argument, the second one very sketchy and the third one banal. The writing improves when he moves on to an appreciation and discussion of all of the extant Mizoguchi films in turn, in the remaining chapters. Unlike Bordwell and Noël Burch (6), who approached Mizoguchi’s oeuvre from a formal, historical and ideological perspective, tracing the trajectory of his career chronologically from beginning to end, Le Fanu has chosen to group the films according to broad themes, working backwards from the late masterpieces to the early melodramas with Meiji settings, but moving back and forth in time in between. He starts with a chapter on “the Great Triptych” (Oharu , Ugetsu  and Sansho ), follows it with a chapter on the films about geishas and prostitutes (covering the pre-war Gion Sisters  and Osaka Elegy  as well as early and later postwar movies), then moves on to the other period films (apart from the Great Triptych), a group of films about “Respectable Women” made in the early post-war period, and finally the early extant melodramas set in the Meiji era, concluding with an extended discussion of The Story of the Late Chrysanthemums . He gives each film considered evaluation, and acclaims the strengths of each. Applying his criteria of evaluation, he rates The Water Magician (1933), The Story of the Late Chrysanthemums and My Love is Burning (1949) as masterpieces, and questions the valuation (high or low) given to some of the other films by other critics. Le Fanu conveys personal enthusiasm for his favoured films and demonstrates alertness to detail in the performances of the actors, the elements of the sound track, the construction of the screenplay and the use of colour. He is interested in film as art, does not like ideological criticism or polemical films but allows that some films (e.g. My Love is Burning) can be works of art despite their polemical bent. He includes some discussion of Mizoguchi’s relation to the wartime regime in an appendix, but is apparently unfamiliar with – or uninterested in – the practices of censorship in wartime and under the Occupation, and the ways in which they influenced film production and practice. He is also apparently uninterested in issues of genre and gender, showing little knowledge of the Japanese film industry. In fact, the weakest chapter in the book is the one devoted to Mizoguchi’s historical, industrial and cultural context. Bordwell is also interested in film as art but is much more rigorous in his analysis of film form and much more knowledgeable about the historical and industrial context. If he has largely underplayed the thematic and cultural dimensions of Japanese cinema, there is a suggestion in his latest work on Mizoguchi that he is now responding feelingly, not just perceptually, to the films. Le Fanu, in contrast, emphasises the cultural and thematic aspects of the films – discoursing at length on their associations with Japanese drama, literature, sociology and art. The juxtaposition of Mizoguchi and Japan in the title of his book is explained by his emphasis on the cultural specificity of this director’s oeuvre. Unfortunately, however, the author is not sufficiently knowledgeable about either Japan or the Japanese cinema to do justice to his subject. In fact, his views of Japan are highly coloured by a sense of its strangeness and unintelligibility. Let us hope that this is the start and not the end of a resurgence of interest in Mizoguchi, and that we get to hear from female critics and scholars as well as male ones, because Mizoguchi was one of the greatest directors of the woman’s melodrama and films about women’s lives. He has been unjustly neglected by recent feminist scholarship. Mizoguchi and Japan, by Mark Le Fanu, British Film Institute, London, 2005. See “Appendix 1: Mizoguchi and French Film Criticism” in Le Fanu, Mizoguchi and Japan, pp. 169-174. Robin Wood, “The Ghost Princess and the Seaweed Gatherer”, first published in Film Comment, vol. 9, no. 2, April, 1973, and reprinted in Personal Views: Explorations in Film, Gordon Fraser, London, 1976. Audie Bock, Japanese Film Directors, Kodansha International, Tokyo, 1978, pp. 33-68; Joan Mellen, The Waves at Genji’s Door: Japan through its Cinema, Pantheon Books, New York, 1976, especially chapters 8 and 14. David Bordwell, “Mizoguchi, or Modulation”, Figures Traced in Light: On Cinematic Staging, University of California Press, Berkeley, 2005, pp. 83-139. Ariane Mnouchkine’s interviews with Mizoguchi’s collaborators appeared in Cahiers du cinéma, no. 158, August-September, 1964; Yoda Yoshikata’s memoirs of working with Mizoguchi were serialised in Cahiers, nos. 166, 169, 172, 181, 186, 192 and 206, in French translation. Noël Burch, To the Distant Observer: Form and Meaning in the Japanese Cinema, Scolar Press, London, 1979, pp. 217-246.